I look up from 60C on my Delta flight from JFK to TLV. A pudgy young guy in a white shirt and a beard is standing over me. “I’ve got the window,” he says apologetically. I snap my laptop shut and squiggle out of my aisle seat. “It’s ok,” I say as he squeezes past me with a hat box and a large plastic bag full of cookies. He places them on 60B. “‘Stand clear of the closing doors, please,’ I hear Niot intone, a broad smile on his face. The door opens and I walk down the corridor to the platform. The last sentence is directed at the red-haired young man sitting across the aisle, who is talking up the young woman sitting behind him, across from me. The figure under the kipah leans into the aisle—he has a bushy beard and intense eyes. “Hi,” the young man said. “I’m Nadav.” He speaks English well, but with a notable Israeli accent. Unlike most of the other men sitting in our vicinity, his head is uncovered. “He was a king of Israel,” says Nadav. “A king of Israel!” Shmuel exclaims. “I never heard of a Nadav who was king of Israel.” He pushes himself up from his chair and surveys the passengers in the back section of the airplane, as if to ask if any had heard of this King Nadav. 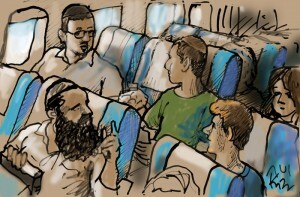 A steward passes between them and asks Shmuel to return his seat to the upright position for takeoff and to keep his voice down as other passengers are trying to sleep. Yehuda stops chatting in Yiddish with the yeshiva student behind me and turns to me. “Is that—waddayoucallit—fiction?” The plane speeds down the runway. I glance at Nadav, who is displaying far more forbearance than I would for the lecture he is receiving from his neighboring Habadnik. “But that’s a true story,” says Yehduda. “Wasn’t the Zohar written in the Middle Ages in Spain?” Nadav asks. Over the loudspeaker a steward asks us to close all windows and turn off lights so that the passengers can sleep through the New York night and into the European morning. Shmuel tips his chair back again, Yehuda dons a neck pillow, I wrap myself in a red airplane blanket, and Nadav puts his head down on his tray table. About four hours later, I’m the first to wake up. I get up, stretch, go to the lavatory, then take out my tallit and tefillin and recite my morning prayers. Afterward, as I wrap up my phylacteries and fold my prayer shawl, Nadav stirs, and we chat briefly about his research. I sit down with my book. Shmuel stretches and says a general good morning to everyone around him. Nadav looks behind him. The girl is still sleeping. He leans over to Shmuel. just letting you know that even if we don’t always comment, we’re all here, reading….good one! loved this for many reasons…..
As a flight attendant this is a story that I rarely hear..If i would have been on that flight I would have just seen passengers as a “blank slate” not knowing their story or why they were standing and moving about….. There is always a way to look at something from a new perspective in order to understand so much….. Religion, science, literature, fiction/non-fiction, midrash and interpretation. Its got it all.